Discover Cuenca Ecuador and BEYOND! 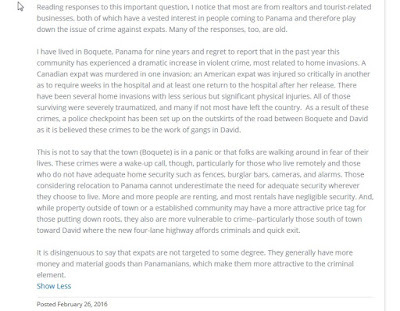 : Why Crime is Minimized in “So-Called” Paradises Abroad, Like Panama for Example? 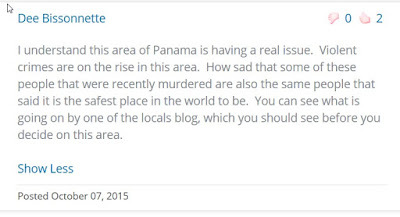 Why Crime is Minimized in “So-Called” Paradises Abroad, Like Panama for Example? Disclaimer: there is nothing in this article that is not already public knowledge on the Internet; we go the extra mile and dig deeper, putting it all together, helping people make sense out of the content that could be misleading people every single day. Sometimes we have to go beyond what’s just inside the box and look at what’s happening outside the box; we can do that because we have no agendas or vested interests. Did You See the Big White Elephant in the Living Room!? People have a tendency to “sweep things under the rug”, so to speak; we like to call it, ignoring the big white elephant in the living room”. When it comes to crime in these pumped up cities abroad, even we got hooked in, just by reading what people are saying online. But we weren’t hooked for long. Unfortunately Google Search has disappointed us, which doesn’t happen very often. 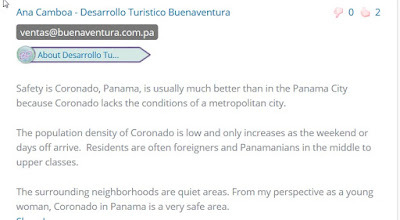 It just goes to show that they can have all of their fancy algorithms in place and cute little panda bears in tip-top shape and the search will bring up inaccurate content, like when you type in EXPAT SAFETY IN CORONADO PANAMA. 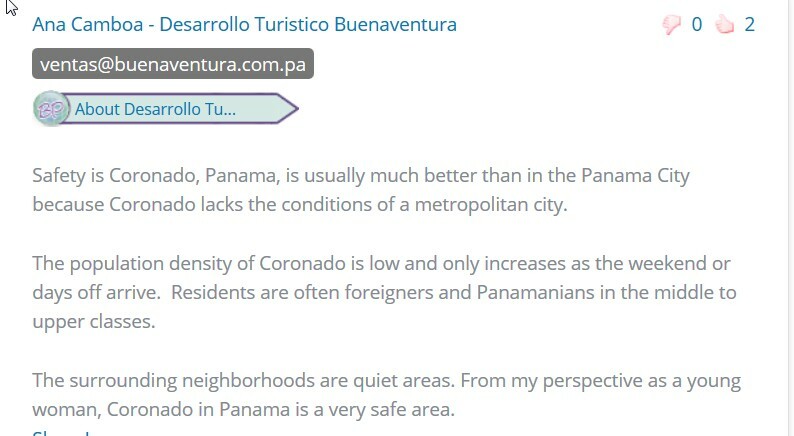 First, add this keyword phrase into Google: Are Expats Safe in Coronado Panama? And this website pops up (Best Places in the World to Retire), and the first three positions in the search is this website; it’s like they have the whole crime market controlled by the real estate developers/brokers and tourist operators who are just about the only ones commenting about crime on this particular website. You can either click here to go to the website or you can simply see the screenshots we took off the website to show you what is going on here. Something is terribly wrong with this picture. Take a hard second look: notice anything similar about the commenters? Clicking on an image will enlarge it. No such thing as “safer than the u.s.”. The u.s. has many different regional areas some with way too much crime and others not so much. Lumping the term u.s. when referring to say, Los Angeles, or Chicago etc. is misleading at best. There are many areas in the Midwest and others that have virtually almost zero crime. Did you notice anything about the commenters as a group? Anyone can walk on the beach and enter into the Coronado community. It’s as easy as walking into a mall. We know that if we were moving to Coronado community, we’d want to hear from people who DO NOT HAVE A VESTED INTEREST!! What about you? 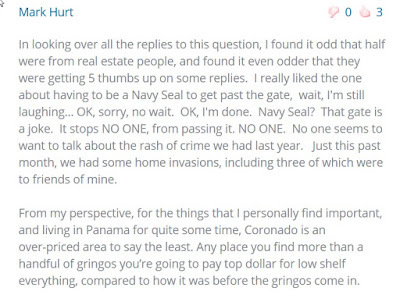 We did a bit more digging because Google really makes you do that to get the “real skinny about crime in Coronado” and found this from an ordinary expat, not a property owner, NOT working in the tourist or real estate business and here’s what he has to say, which puts things into better perspective. The reality is most expats will not go to page 2 of Google. And very few will continue searching once they read what the above website says. So, here is many folks, looking to retire in Panama, still being mislead from people with vested interests. 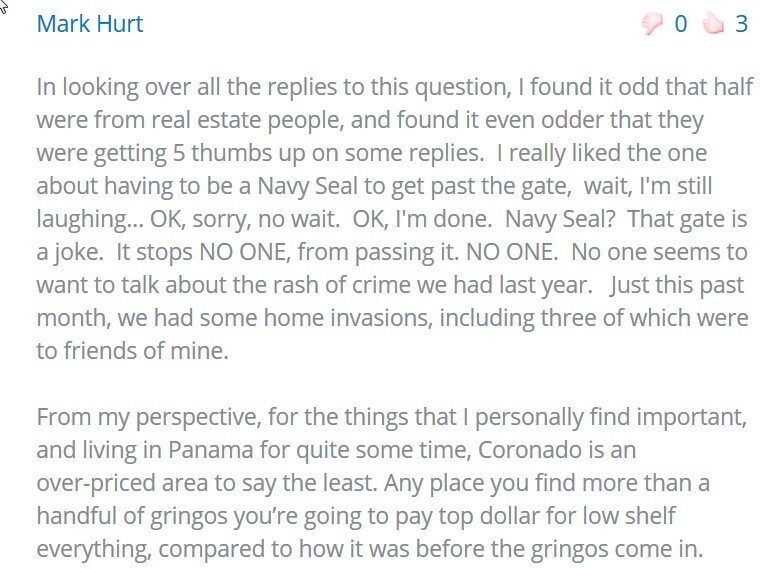 Folks, please do your due diligence and scour the Internet and talk to Panamanian locals that are not in the real estate or tourist services about crime. UPDATE 2016 - LOOK, finally after we wrote this article someone finally stepped up to the plate and let it all out! Foreigners need to know this stuff. Make sure you enlarge the photo to read it. Here’s our story. Before we went to Panama on a scouting visit we did the online research just like anyone would, we went to the first three websites and read the same comments from that same website that we are showing you today. We thought, “Oh Panama seems safer than Ecuador”! After all, that’s what Google search is putting out for folks searching about crime in Panama in Coronado. 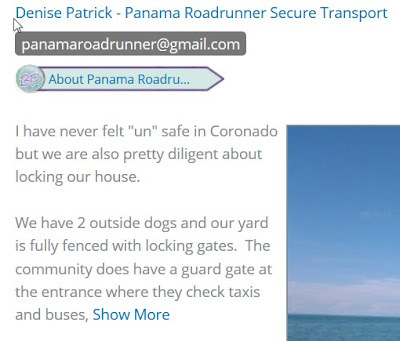 Seriously, we thought Panama was pretty safe going in from what people were saying and we walked around all over in “off the beaten path” areas of Panama City and we both felt uneasy in some of the areas, which is typical when you walk off the well tread areas. We asked several different people about crime in Panama City and there are two areas we were told to stay out of, even during the day. One taxi driver mapped the areas out for us, which is on another video coming soon. 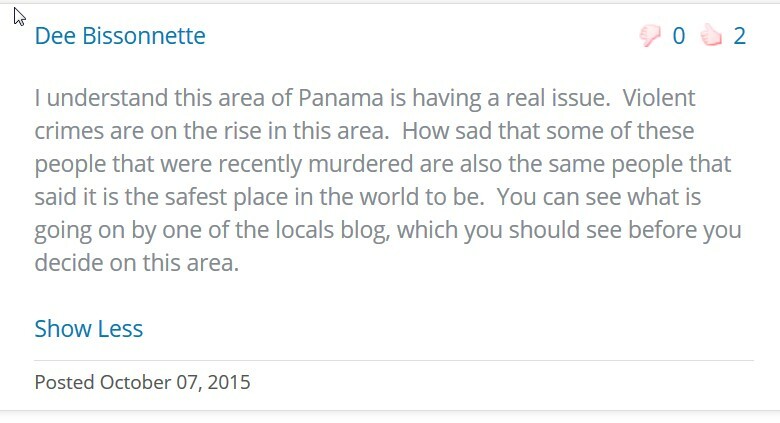 One night while we were still in Panama, I decided to do more research than just the first page of Google and I ended up on the second and third page which brought up a lot of really horrific crimes against expats in Panama. Not trying to scare anyone; that’s not our intention. We only want to inform you that Panama is not what it seems on the surface of things. Still wondering why you have to dig to find this stuff. Folks with vested interests will minimize crime, they will downplay it, and they will compare crime to many places in the U.S and say it is much better in the paradise they are hyping up abroad…and until they are a victim of a serious crime, that’s how they are going to play it. Mr. and Mrs. Diligence says that even one armed robbery and home invasion against one expat couple or local couple should not be swept under the rug, and yet armed robbery and home invasion are frequently happening in expat communities and everyone seems to minimize it and keep it hush-hush! People who have been victims of crimes have been hurt, they have been seriously trespassed upon and minimizing the crime issues in expat communities abroad does not help anyone! 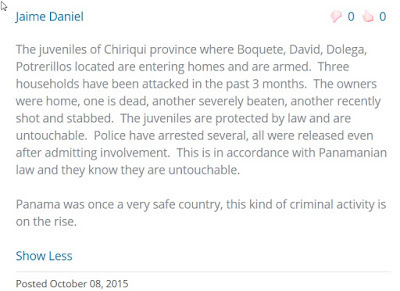 And if you’re thinking that living out in the country in Panama somewhere will be safer, guess again. Read the whole story from an expat victim here. There are many uneasy expats that have been emotionally damaged, leaving comments about their experience of being a crime victim. Reading their stories will bring chills down your spine. These are the things that you will not hear from the travel abroad press or other folks with vested interests. Not all crimes are published as many expats are staying hush-hush so they can sell or rent out their homes in these expat enclaves to unsuspecting expats. Panama has a lot going for it, and could be a great place to live, but minimizing and/or sweeping serious crimes against foreigners under the rug is a crime against humanity in and of itself. You are not helping to improve Panama by doing this. You are prolonging the problem. Instead, let us all get it out into the open where maybe someone in authority decides it’s time to do something positive about it. We think you might also like these articles. 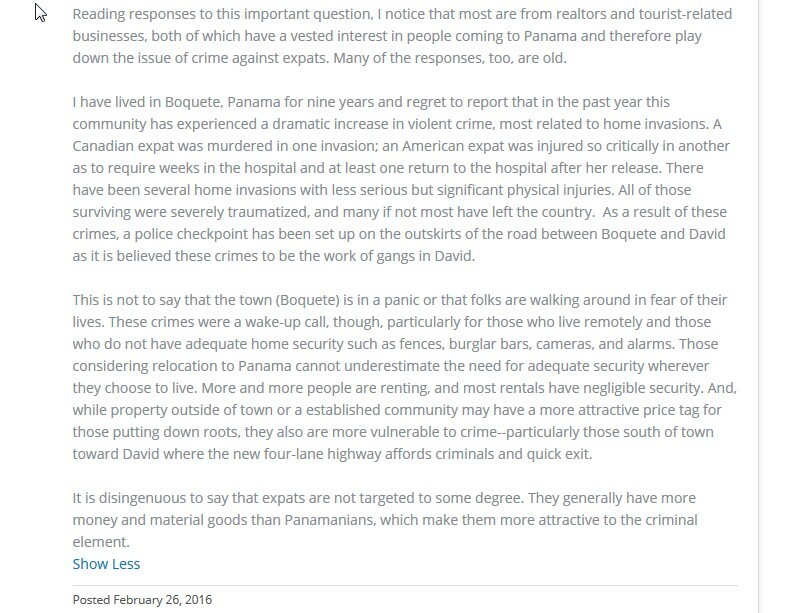 Crime against Expats in Ecuador vs. Panama: Is There a Difference? 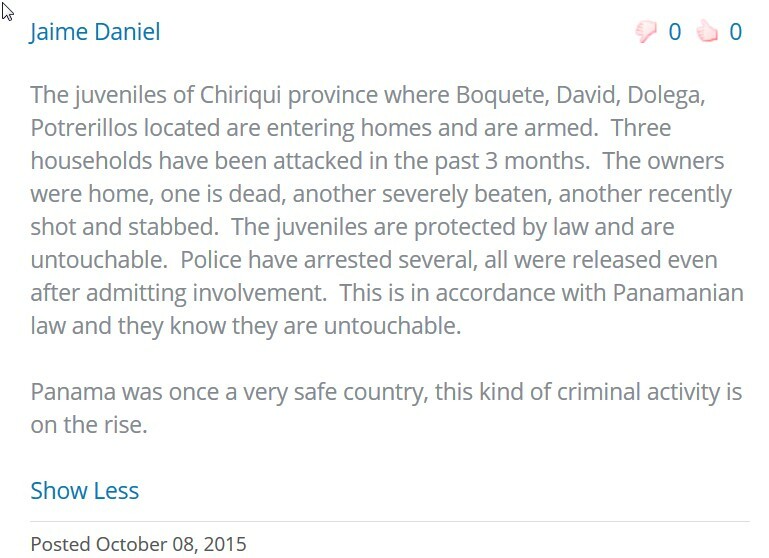 How Do Ecuadorians Protect Themselves from Crime? Another two cent worth... Coronado Panama, yes sir been there and got the sells talk about it some years ago. Lets look at another angle to the area... the story I got from people moving there started like this, we went to a meeting in North America and paid into an apartment UNSEEN in Coronado Panama. Got there late on a Thursday, met people like us and the next day was off playing golf, playing cards, eating, movies at the complex, meeting new friends... a great WEEKEND! Then on Monday morning they noted few at breakfast, almost no one there. Asking the workers, they where told that the people lived in Panama City and came to Coronado only on some weekends or holidays... no one lived there as a rule ????? Heard this story more than once about lots of places. Once the buildings filled up then the prices went up as they try to find another buyer at a higher price (LARGER SUCKER THEY CALL THEM I THINK?) When the brokers says the prices will go up, well yes they do, question is will there then be buyers? Quick run down on the game and how it's played... the builder does a pre-sale to get funds to buy the land and start the building (good time to get in IF the guy doesn't run off with the funds leaving you without recourse). Then the builder does another sell as the building is up but not finished (if he can't keep the cash flowing the project can go broke and all lose) Then, if and when finished (remembering your in the third world and things move slow), the top dollar is asked, hopefully the place fills up and all looks good for that time. Then you find that the builder will manage the complex for 2 years before the owners can elect their own board and take over. Ever heard of maintainous fees, management fee, start up fees, staff fees, builder's error fees, correction fees, over run fees, landscaping fees, move in fees, clean up fees, over looked fees, add on fees... well you will AND others too. But you get the pride of ownership ????? They say you can hire a maid, driver, yard man, etc. for a few dollars a day (with add on's like taxi fare [they ride the bus and pocket the extra], uniform they need to buy [they took one from another job that the owner got for them], Then the extras they say you need to give them by law like: taxes ?? ?, insurance ??? holiday pay ?? ?, overtime pay ??? worker's comp ... and on and on... and they always are telling you about a new law which you have to pay them more for. Then you have a worker(s) that you have to watch all the time, direct, teach, remind, and keep the work coming or find them sitting down watching the TV. Now the question is, can these low priced worker take anything at anytime OR sale/ tell others what you have and give them a key to the front door for a cut of the take? COULD they do this? YES many questions to ponder... and live out of town, even in a walled area thinking your safe. Well I know better... I had my share of trouble in downtown Panama. And for the ones who think the law will help you... They passed a law as I was leaving stating, if you said something about a person they found to be attacking / insulting to them, they could sue you... even if it was TRUE. It could find you in jail for a few years. Then there were just the general people around who would just kill you! On TV I saw in the daily news people picked up with guns, mostly ex-cons or escape felons (bad boys). OK... no place is per-fit, I live in a state that will soon have open carry of guns (lots of states now do). Yes sir, just like the old West on TV, have it right on your hip. Never mind the fact that crime in the states that have this law, the crime has gone way down. Look friends, like Frank and Angie say, you got to do your home work, dig down deep, below just the top news. Join ex-pats on the web and ask them. I can tell you first hand that many people there can see NO WRONG with the place. They will tell you that it has the best people in the world... you be the judge.